Pandy Cottage is located about ten minutes walk from the centre of Talybont village, about four miles from the resort town of Barmouth. It stands in approximately half an acre of ground bordering the Ysgethin stream on its way to the sea. Formerly a Fulling Mill involved in the cloth making industry, Pandy Cottage has been completely renovated and refurbished to a very high standard. Our aim is to provide our guests with the comfort and warmth of a family home whilst also retaining many of the original features wherever possible. 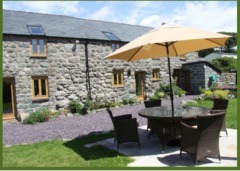 Pandy Cottage is a Five Star Luxury Accommodation built of stone with a slate roof. It has been tastefully furnished and finished in oak. It can accommodate up to seven persons plus cot and it is fully centrally heated throughout the wood burner in the lounge makes it very cosy in winter. LOUNGE An extremely spacious lounge featuring an inglenook fireplace housing a wood burning stove ( a good supply of logs is provided), freeview TV, DVD Player/recorder and CD player. KITCHEN/DINER Cream Oak fitted kitchen with built in ovens, fridge, dishwasher and microwave, complete with granite worktops and breakfast bar. Oak dining table and chairs, freeview TV and Welcome Pack (bread, milk, tea, coffee, sugar, butter etc.). TOILET Ground floor toilet with hand washbasin. Oak stairs lead up to four bedrooms three are en-suite bedrooms and the fourth bedroom has a private separate shower room. BEDROOM 1 Double bed, built in wardrobe, plus the usual bedroom furniture including freeview TV and DVD player. En-suite bathroom contains whirlpool bath with shower over, toilet and washbasin. BEDROOM 2 Twin Beds, built in wardrobe plus the usual bedroom furniture. The en-suite shower room has a toilet and washbasin. BEDROOM 3 Containing one single bed, wardrobe plus the usual bedroom furniture. Separate private shower room has toilet and washbasin. BEDROOM 4 Double bed, wardrobe plus the usual bedroom furniture. En-suite shower room has toilet and washbasin. GARDEN The lawn is surrounded by shrubs and contains a patio area complete with garden furniture and barbecue. UTILITY ROOM This contains a washing machine, tumble dryer, fridge/freezer, iron and ironing board. SECURE SHED The shed may be used for storing bicycles, wheelchairs, mobility scooters, pushchairs etc. LOG STORE Contains a supply of logs for the wood burner. PETS We regret that pets are not permitted. ARRIVAL/DEPARTURE Lettings are on a weekly basis from FRIDAY to FRIDAY. Guests are requested to vacate by 10:30am on the morning of departure and not arrive before 4:00pm. We must be informed of late arrivals in advance. WHAT IS INCLUDED IN THE PRICE: Electricity, oil, and logs for the wood burner and VAT. Bed linen (all beds made up prior to arrival), towels. Cots and highchairs are also provided. 5 STAR GRADING by Visit Wales under their quality assurance scheme. OCCUPANCY The accommodation is designed for occupation by up to SEVEN persons plus a cot this is the maximum number that will be permitted.